When we think about Venus, we instantly think of love and satisfaction it brings our way. Still, with Venus currently in the sign of Aries, we need to see its negative sides too, or we won’t be able to fix what is broken in its inner world and our world of partnerships and love. While it is a planet of all senses, togetherness, hedonism, and emotions shown in the physical world, it is also a goddess of prostitution, betrayal, perversion and gluttony. To understand its world, it might be best to start with observing the planet itself. Venus is the warmest planet in the Solar system. Its atmosphere is kind of hellish, for it is covered with clouds of sulfuric acid that never let the light of the Sun touch its surface. These clouds don’t allow us to see what it hides either. The pressure one would feel if they decided to visit would be close to that you’d feel about 900 meters into the ocean. Its temperatures stay close to 460 degrees Celsius and its surface is a dry desert with the most intense volcanic activity of all the planets that circle the Sun. Interestingly, from our perspective it is the brightest glimpse of light in the sky (apart from the Sun and the Moon), our guiding light and our prime inspiration for writers and poets as morning and evening star. In Astrology, Venus rules the sign of Taurus and the sign of Libra, both standing for beauty of touch, senses, emotions, relationships and art. We will find that the most maleficent star of all – Algol, still stands in the sign of Taurus, and it has already been there for about two thousand years. It is a reminder of the severed Medusa’s head in the mythological background of the sign. Not only did the Medusa’s look turn others into stone, but it continued to do so even after her death when her head was used as a weapon. 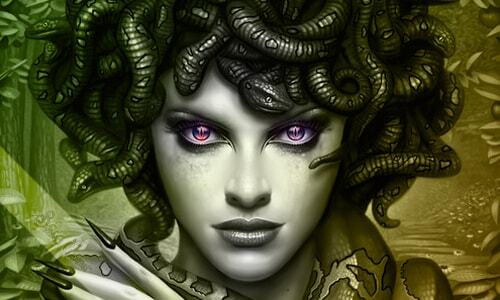 Another thing to keep in mind here is the fact that the story of Medusa speaks of a normal girl who (depending on the version of the myth) got either raped or tricked, pregnant and abandoned, and turned into a “monster” through her rage and emotional pain. This can be observed as a love story that led to ultimate destruction, and it reminds us that the only thing we can do to be heroic, is to decapitate our jealous, hurt, vindictive feminine nature within. It is the place of greatest female hurt in the physical world of patriarchal dominance and instinctive sexual desire. To add to that, the myth of Taurus speaks of betrayal among women and jealousy that makes them hurt one another, even if it takes a chase to the end of the world. On the other hand, Venus rules the sign of Libra – the sign that rises from the fall of Venus in Virgo, only to lead it to detriment in Scorpio. It is a bright spot between two extremes of its dismissal, and carries within the myth of Astraea who got disappointed by the entire human race, and measures souls to decide who is to… well we can simplify – go to hell. The entire half of Libra is named Via Combusta or “The Burnt Trail” and all the way up to the 15th degree of Scorpio, effects of this road of destruction are observed. To be real about its role in our chart, we need to see both positive and negative sides to Venus, and realize that it is just a planet after all. Its mythological role primarily is that of love, emotion, sexuality, fertility, charm and beauty, but the inspiration it gives can be found in Hell itself, just like it can be found in sparkling emotions of attachment, love and passion. It is the force that divides us and makes us feel whole, the ruler of the touch of birth on the 3rd degree of Taurus as well as the one to represent a jealous, angry, abandoned, raped women, and the loss of pregnancy itself. It is the point of perfect balance in Libra just as much as it rules perfectionism and dismissal that take away colors from life and face us with all our fears. The main task our Venus has is to learn to manifest through our daily routine with a certain easiness, flexibility, and a fertile, charming and loving expression, in the flow of faith, truth, and devotion to Pisces, the sign that exalts it. It will be expressed through our talents and our mission, and must carry a secret to be satisfied, hidden under its clouds to keep us intrigued and inspired. Our realistic views might kill some of its magic. Still, when we are lulled to sleep by its mysteries, we might fail to see our personal domain of satisfaction and all the beauty we can achieve in this lifetime if we face what is wrong. Its goal is easiness and letting go, but it is often bruised and damaged to remind us to fix what is broken and change perspective until we see things beautiful just as they are. Our main objective should be a balanced perspective that allows us to believe in beauty and see it in all its colorful acidic, boiling, pressuring glory, being a miracle just as it is – perfect for the Sun that holds it close.